The proceedings of MANPU2016 is available in ACM Digital Library. Please visit here. Comics is a medium constituted of images combined with text and other visual information in order to narrate a story. Nowadays, comic books are a widespread cultural expression all over the world. The market of comics continues to grow, for example, the market in Japan is about 4.25 billion USD in 2015. Moreover, from the research point of view, comics images are attractive targets because the structure of a comics page includes various elements (such as panels, speech balloons, captions, leading characters, …), the drawing of which depends on the style of the author and presents a large variability. Therefore comics image analysis is not a trivial problem and is still immature compared with other kinds of image analysis. 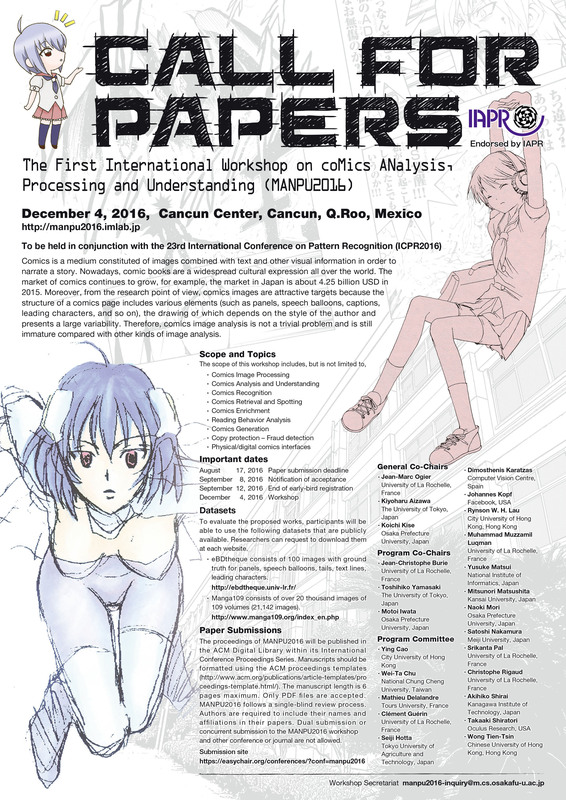 Note: Early-bird registration fee will be applied to the authors of accepted papers. Registration should be done via the 23rd International Conference on Pattern Recognition (ICPR2016) Registration page. To evaluate the proposed works, participants will be able to use the following datasets that are publicly available. Researchers can request to download them at each website. eBDtheque consists of 100 images with ground truth for panels, speech balloons, tails, text lines, leading characters. Manga109 consists of over 20 thousand images of 109 volumes (21,142 images). The proceedings of MANPU2016 will be published in the ACM Digital Library within its International Conference Proceedings Series. Manuscripts should be formatted using the ACM proceedings templates(http://www.acm.org/publications/article-templates/proceedings-template.html/). The manuscript length is 6 pages maximum. Only PDF files are accepted. MANPU2016 follows a single-blind review process. Authors are required to include their names and affiliations in their papers. Dual submission or concurrent submission to the MANPU2016 workshop and other conference or journal are not allowed. Paper submissions for MANPU2016 will be handled through the Easy Chair conference management system.